Post by Seth M. Rodriquez, Ph.D.
"What do those words make you see?" Years ago, I worked as a reading tutor. It was my job to help people decode written words and understand the meaning being communicated through those words. Reading comprehension experts will tell you that the best way to understand and remember what you read is to allow the words to create pictures in your head. As a tutor, I was trained to repeatedly ask the question: "What do those words make you see?" It is no different when we read the Bible. As we read, we should allow the words on the page to form pictures in our head. Unfortunately, this can sometimes prove to be a challenge. Often we are not familiar with the places and things mentioned in the Bible. How tall was Mount Carmel where Elijah called down fire from heaven? 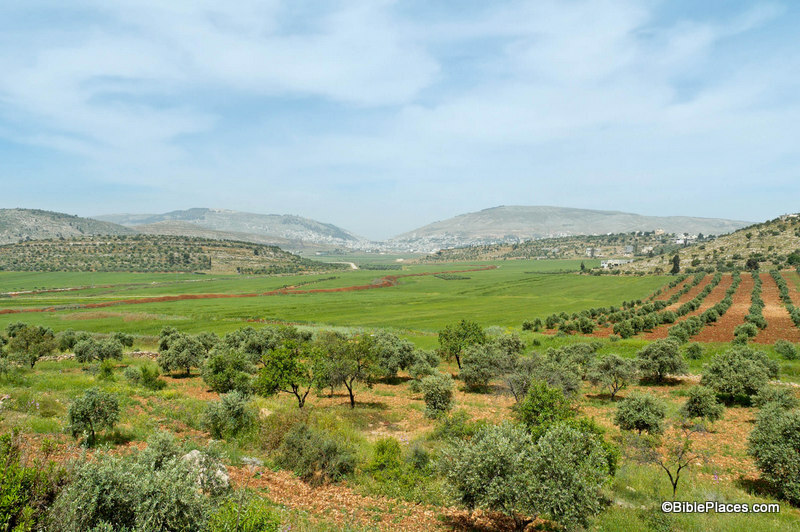 How dry is the Judean Wilderness where David hid from Saul and where Jesus was tempted? What is a horned altar and what did look like? Fortunately, today we have the means to bridge the gap between our world and the world of the Bible. Collections of images provided through websites such as BiblePlaces.com and LifeintheHolyLand.com can go a long way in helping us to form vivid pictures in our minds of biblical places, characters, and events. To help you on the journey, I am kicking off a new series on this blog called, "On Location." As the name implies, we'll go "on location" with the people in the Bible. We will see some of the same sights they did ... or at least see what these sights look like in modern times. The goal is to help you more accurately visualize the biblical stories. What do those words make you see? Let me help you out with the last few verses where Abraham enters Canaan for the first time and arrives at the site of Shechem. Shechem (modern Nablus) lies between Mount Gerizim and Mount Ebal in the very center of the land of Canaan. However, there is no indication archaeologically or in the biblical text that there was actually a city there in Abraham's day. The city seems to have been founded in about 1900 B.C., about 200 years after Abraham would have passed through here. So to help paint our mental picture, we need to get out of the modern city located at the site of Shechem and see some wide open spaces nearby. In the image below, we are standing a few miles away from Shechem and we can see Mount Gerizim and Mount Ebal in the distance. This is similar to what Abraham would have seen back in 2100 B.C. A close-up image of the Shechem area will help us complete our mental picture. The modern city sprawls over the area today. So to help us form a proper image in our minds, it is helpful to dig into one of the historic collections provided through LifeintheHolyLand.com and go back in time. 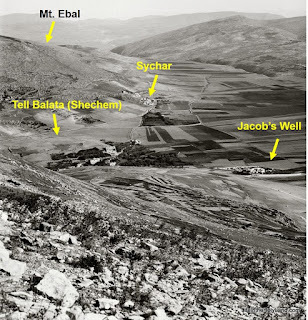 This next image shows what the area between Mount Gerizim and Mount Ebal looked like about 100 years ago. The photographer is standing on Mount Gerizim and looking across the valley. 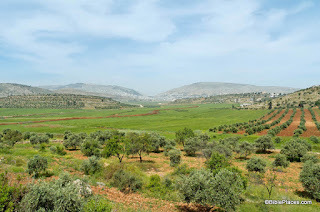 In Abraham's day, this area probably had many more trees than can be seen in the image below (Joshua 14 mentions a forest covering this region) but you can get a feel for what the topography is like through this photograph. According to Genesis 12, this was the place where God spoke to Abraham shortly after he entered the land of Canaan for the first time. This is where He made Abraham the promise, "To your offspring I will give this land." And in response, this is where Abraham built an altar to the Lord. More images and information about Shechem can be found on the BiblePlaces website here. 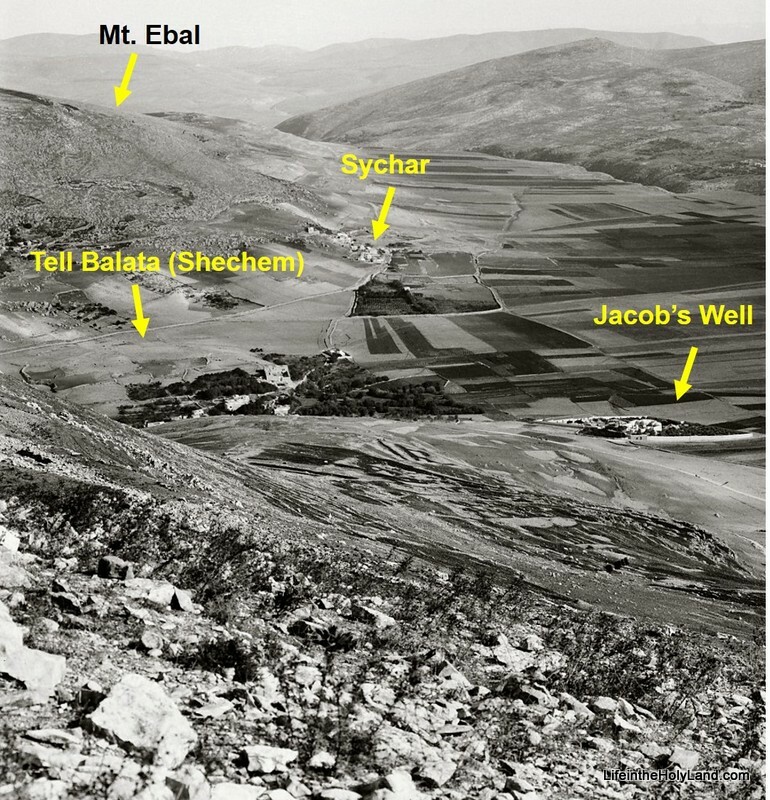 Historical images of places from Abraham's life can be found on the LifeintheHolyLand website here. The images used in this post were taken from Vol. 2 of the Pictorial Library of Bible Lands (available for purchase here) and Vol. 1 of the American Colony and Eric Matson Collection (available for purchase here).